This zombified janitor has seen better days. 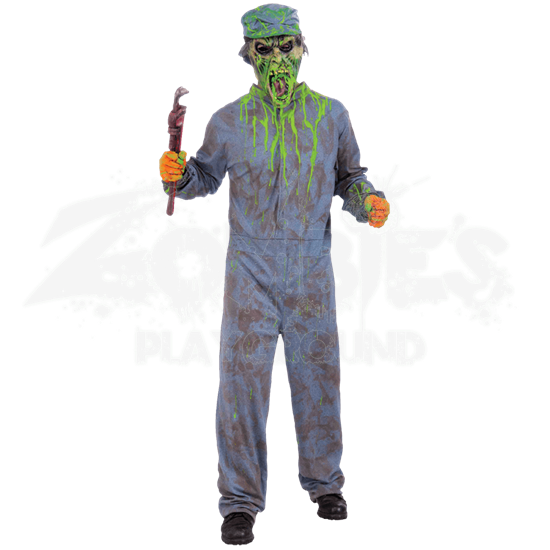 In fact, anyone wearing this Biohazard Zombie Janitor Costume will look like an impressive zombie that is ready to give up on fixing and cleaning in order to embrace total zombification. This costume consists of a blue-gray jumpsuit, one that could be easily pictured on any sort of handyman profession, ranging from janitors to mechanics of all types. The jumpsuit is soiled and covered with brown stains, giving it a rough and worn appearance. Drenching the front and shoulders are several bright green stains, signifying toxic waste or some sort of biohazard material. Included with the jumpsuit is a face-mask that features stretched, emaciated skin with an elongated and opened jaw that is ready to start chomping and chewing on the living. The mask also features open eyeholes, which allow the wearer to see out. Attached to the top of the mask is a matching cap stained with more green slime. Please note that this costume includes only the hat with attached mask and the jumpsuit. Any other accessories shown, like the gloves, shoes, or wrench are not included. The costume is available in one standard size, which is sized to fit up to a 42 inch chest. 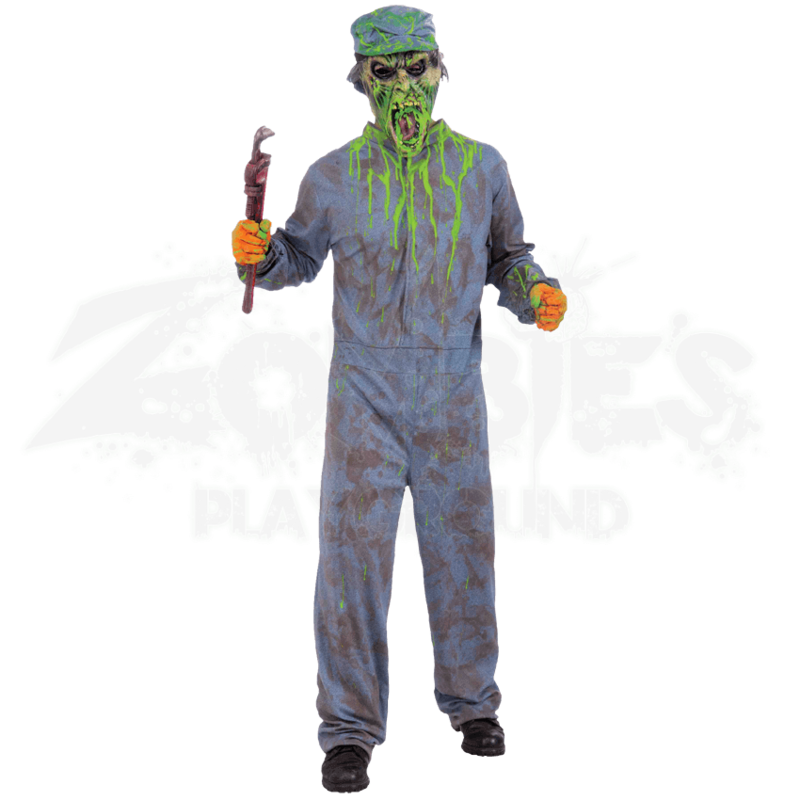 You will look like a zombified handyman whenever you put on this Biohazard Zombie Janitor Costume, although like any zombie, your inclination to do anything but feed on brains and flesh is likely to determine how much fixing and cleaning you actually do.